"Granny's best bread recipe, ever! Try it for yourself!" In a large bowl pour the boiling water over the rolled oats. Add the scalded milk and stir. Pour in the oil and molasses. Stir well. In a separate bowl mix the sugar with the yeast and 1 cup of the flour. When the oatmeal mixture has cooled to lukewarm add the yeast-flour mixture. Stir in the salt and remaining 5 cups of flour. Knead dough for 6 to 8 minutes. Place the dough in a covered greased bowl and let rise until doubled, about 1 1/2 hours. Punch the dough down. Knead for 2 minutes. Divide dough into two pieces and place into greased 9x5x3 inch loaf pans. Cover pans and let rise until almost doubled in size. Bake in a preheated 350 degree F (175 degrees C) oven for 1 hour, or until nicely browned. Let the loaves cool on a rack. Remove loaves from pan; wrap well and store in a cool spot. I LOVED it! But, I love Molasses. I used applesauce instead of oil, splenda instead of sugar, and whole wheat flour. Excellent Recipe!! 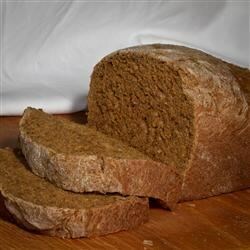 This is great oatmeal bread. I like it even better when using mostly honey instead of other sweeteners. Excellent taste, excellent texture - I made this in my Bosch and it was easy!